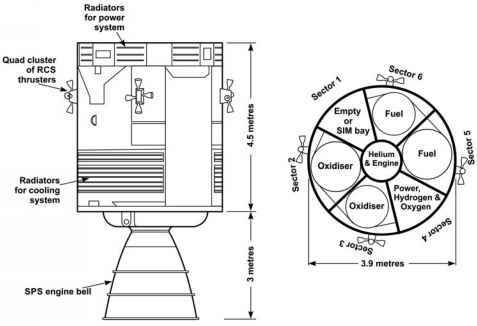 The external and internal layout of the service module. 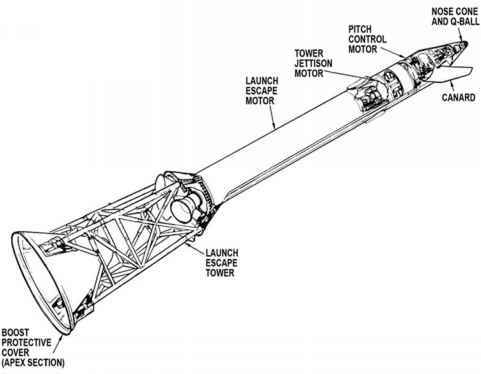 escape tower, a load that increased by a factor of 4 towards the end of the Saturn's first stage of flight. Its strength came from the beams and trusses of its internal skeleton, and the panels that subdivided its volume and formed its external skin. These panels were largely hollow, formed from a sandwich of aluminium honeycomb bonded between aluminium sheets. The sectors around the tunnel were numbered 1 to 6. The first was one of the smaller sectors, subtending only 50 degrees, and was left empty for the early Apollo missions apart from a load of ballast that served to keep the craft's centre-of-gravity within limits. After the Apollo 13 explosion, an additional oxygen tank was added to this sector for Apollo 14. For the J-series missions that followed, this sector gained another tank filled with hydrogen in order to help to supply the increased power needs of these more demanding flights. Another modification for these intensively scientific missions was the addition into this sector of a suite of remote-sensing instruments and cameras to study the Moon from orbit. and 6 accommodated a pair of titanium tanks for the SPS engine, in this case for fuel. In the central tunnel, two tanks of helium provided gas to pressurise the fuel and oxidiser tanks.